The Council is committed to examining the data needed to develop an equity policy framework that would require the County to question how budget and policy decisions impact equity. must challenge itself to bring new and different partners to the table. Partnering with other jurisdictions as members of the Government Alliance on Race and Equity (GARE) will also enhance the County’s effort and commitment to fostering equity. Equity analyses should be part of capital and operating budget reviews, appropriation requests, and legislation. Program and process oversight should be undertaken viewing programs and processes through an equity lens. Equity targets and measures of progress must be put in place. The Council will provide additional FY19 Operating Budget resources for the Office of Legislative Oversight to develop a baseline report describing current disparities in education, employment, housing, health, employment, land use, and other measures of opportunity by May 31, 2019. Following the transmittal of the baseline report, the Council will introduce legislation for the County to develop an equity policy framework to inform the delivery of all County services. 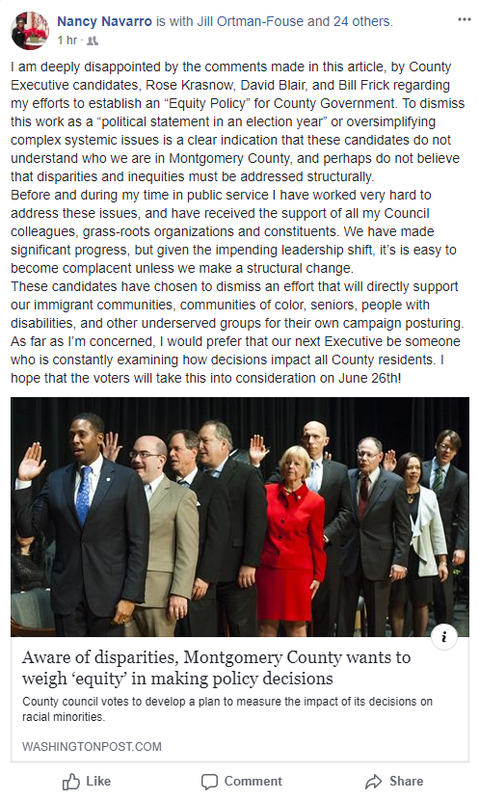 I am deeply disappointed by the comments made in this article, by County Executive candidates, Rose Krasnow, David Blair, and Bill Frick regarding my efforts to establish an “Equity Policy” for County Government… These candidates have chosen to dismiss an effort that will directly support our immigrant communities, communities of color, seniors, people with disabilities, and other underserved groups for their own campaign posturing. As far as I’m concerned, I would prefer that our next Executive be someone who is constantly examining how decisions impact all County residents. I hope that the voters will take this into consideration on June 26th! We see Navarro’s point. Montgomery County, like the rest of the United States, is rife with inequities of all kinds. Navarro’s resolution does not prescribe specific remedies; it only initiates the process of measuring inequities so that they can be considered in public policy decisions. It’s hard to understand how any progressive candidates for office could oppose that. Perhaps Krasnow, Frick and Blair would like to comment further before their existing remarks are set in stone. Actually, the Civil War was all about race since the primary reason the Southern states seceded was to protect slavery. This is a proven fact given what the Confederate states themselves said in their declarations of secession. States’ rights, the argument for the war which was subsequently made up in an attempt to whitewash history decades later, does not appear in the declarations but slavery is mentioned over and over. Georgia and South Carolina specifically criticized the federal government for not forcing Northern states to send back escaped slaves and punish those who aided them. This is an argument AGAINST states’ rights and certainly against “true freedom.” Here’s a sample from the declarations. As for what is happening now, it’s all about race. Anyone who doubts that should watch this video made by a reporter who embedded herself with the racists and anti-Semites who marched in Charlottesville. Listen to what they say and what their intentions are. They leave little doubt about their agenda. It’s hard to commit a bigger gaffe than Delauter’s threat to sue a newspaper for “unauthorized” use of his name. 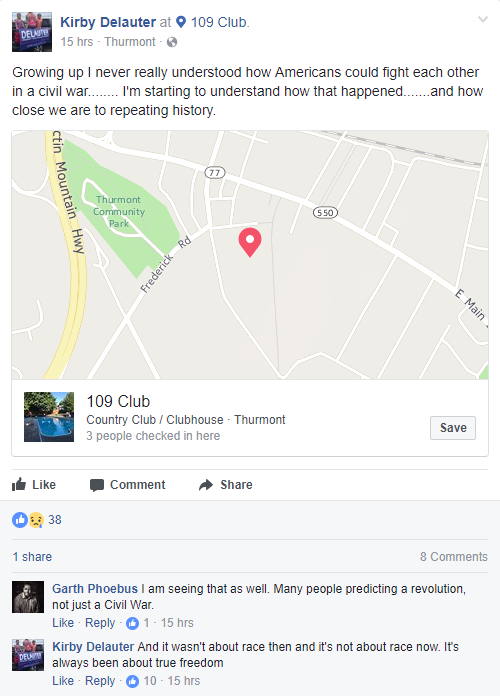 But Delauter has accomplished the impossible by claiming that the Civil War and current social disruptions are about “true freedom” and not race. Delauter is currently running for County Executive. Frederick County voters will have several choices for that office in both parties who are vastly superior to Delauter. Hopefully they will end his political career once and for all. Yesterday, I looked at the partisanship of early voters. Today, I take a peek of the age and racial demographics of early voters based on data graciously provided by a reader. The estimates of the racial composition of the electorate are based on estimates of the race of voters with the caveat of the potential for errors. Not everyone named Morales is Latino just as not everyone called Goldberg is Jewish. Nonetheless, the information provide a useful first cut at who is participating in early voting. Early voters skew heavily towards older voters, especially among Republicans. At 74.4%, nearly three-quarters of GOP voters are over age 50. The Democratic share older than 50 is around 5% lower at 69.3%. Among all early voters, which includes unaffiliated and third-party registrants, the share is 68.9%, slightly lower than for Democrats. The low figure reflects much less skew towards older voters among non-major party voters. In contrast, people 35 and under make up a low share of early voters–11.7% among all voters and just 11.4% among Democrats and 9.5% among Republicans. The latter figure reflects the heavy skew away from Republicans among millennials. The next table shows the racial composition of each county’s electorate. Percentages add up to less than 100% because the race or ethnicity of many voters is unknown and cannot be reasonably gauged to any extent by proxies. As a result, the percentages presented here are invariably low end estimates. Among early voters, African Americans are high participants (31%), exceeding their share of the voting-age population. Unsurprisingly, black participants overwhelmingly outnumber other groups in Prince George’s and Baltimore City. In Charles, African-American early voters barely edge out whites–a sign of the continuing evolution of racial demographics in that county. The encouraging rates of black participation help explain why Democrats are consistently outperforming Republicans in early voting. Not only does Maryland have vastly more Democrats, they are voting at a higher rate than Republicans. In contrast, Latinos (3%) and Asians (3%) appear to be casting early votes at low rates, reflecting lower rates of citizenship and turnout. Asians compose the highest share of early voters in Montgomery (7%) and Howard (6%). 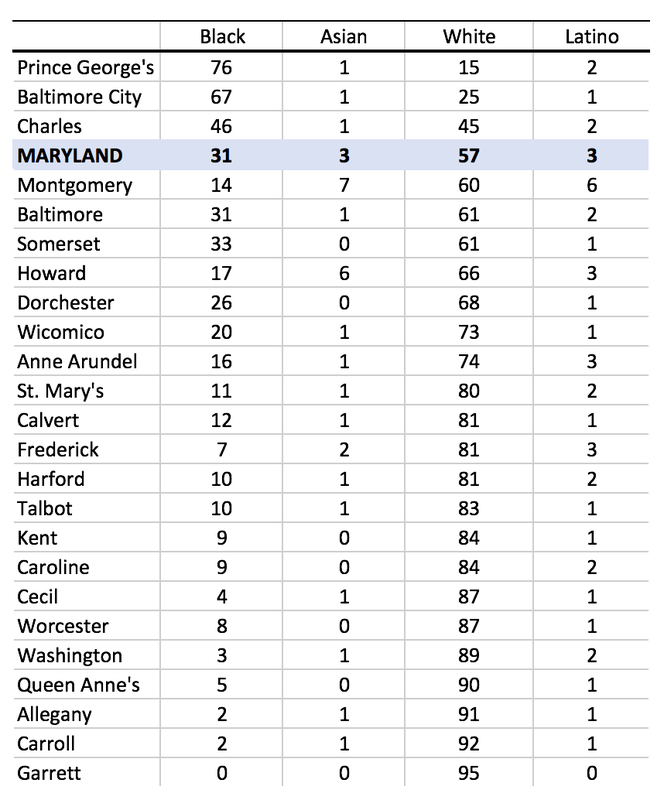 Latinos comprise 6% of early voters in Montgomery, and 3% in Anne Arundel, Frederick and Howard. In Maryland as a whole, approximately 57% of early voters are white. Again, as the percentages are calculated out of total voters and many could not be placed in any category, the estimates for all racial groups are low.